There are many "production" water features here in southern California; mostly hailing from the good old days pre-dating the tax law changes of 1986" when developers could better afford the luxury of extensive landscape embellishments. These large ponds, waterfalls, streams and fountains serve a few important purposes; certainly they add value in the way of enhanced quality of life and property re-sales, but ornamental water effects do a great deal more. Their appearance and splashing sounds do a great deal to mask the loud and crudeness of crowded life here. Without them, the rumble of car and air traffic noise might be intolerable. Unfortunately, as economic booms and busts prevail, many non-biologically minded folks get into the "pond business" when times are good without knowing or practicing sufficient knowledge of design or construction of such effects. Such features, without adequate provision for filtration, draining, cleaning, can be a real ongoing nightmare for the persons/company charged with maintaining them. Such is not the case for the most part with the example here, an intentionally poisoned (i.e. non-biological) pond and waterfall in a commercial setting in Sorrento Valley, San Diego, California. The pond basin sits off center to main buildings that are part of the same property, presenting an impressive entry and adding to the ambience for workers on break or lunch. The fifty tons or so of rockwork is mainly centered on a beautifully done waterfall. Very nice on driving by or entering onto the complex. The ponds sides are sloped at about sixty degrees to vertical, with a more or less uniform depth one and a half foot (this necessary for safety's sake as well as to conform with State and local laws concerning such "attractive nuisances"). The basin is overall kidney shaped, approximately 80' long by 20-30 feet; and about 23,000 gallons total. It is exposed to direct sunlight all day long. Of note; some of the greenbelt (grass) surrounding the edge has grown to be above the ponds concrete berm; this presents considerable problems in dirt and fertilizer entering the water. This is an archetypal "production" pond of waterproof liner over dirt, chicken wire tied to a berm support of staked-up rebar, shot-creted with six sack mix and brownish coloring. The "knockdown is purposely rough, with the edge patted with tow-bys of wood and the bottom only cursorily bull-floated. This isn't just laziness; a rough finish provides good footing for human workers and accidental fall-ins. The bottom does slope to a definite "mid-drain" about in the middle of the basin in front of the fall. There is an alternate intake to the pump located at its bottom which meets up in the skimmer and collectively flows back to the pump. This 7.5HP unit is located adjacent, sub-grade in a concrete vault. The waterfall construction is a paradigm of excellence; an example of how to do these things right. A substantial base of concrete and block was cast such as a building foundation to support the upper basin, and the pond liner was fitted as one piece, continuous with the upper, lower basins and waterfall face. Rocks were placed and mortared over the liner such that the water is always contained over the waterproof membrane. Filtration: is really non-existent. Large elements like leaves and bags are hopefully screened out by way of the general intake skimmer. This device has been pitifully fitted with a number of swimming pool variety intake baskets. How is the water kept clean/clear? You guessed it, by way of general biocides, toxic chemicals such as used for swimming pools and spas. Additional, periodic cleaning involves bringing out a gas powered vacuum unit to discharge accumulating solids on a regular basis. Livestock: There are intentionally no living organisms in this system. No fishes, plants, birds, nada. In the absence of insect eating life, sufficient chemical residue must be maintained to destroy mosquitoes and other pests. Weekly water testing and adding of sanitizer (chlorine), and possibly stabilizer (cyanuric acid) are about all the chemicals used. In Southern California our "liquid rock" water has sufficient mineral concentration such that we rarely have to bother with diminished alkaline reserve (no buffers added here). A swimming pool genre "leaf rake" net for cleaning out debris, the vacuuming mentioned above and cleaning of skimmer is about it. Make-up water is supplied through an automatic float valve. Actually only one; to keep an eye on and if necessary improve on the drainage between the basin and the surrounding landscape. Provision needs to be made that dirt et al. not wash into the water. Trenching, French or other drain type will prevent this. Otherwise, this feature adequately does what it is intended to do; produce soothing sights and sounds, masking out nearby street and freeway noise. If it had been intended as a biological system, more sharply sloped sides, greater depth, and an alternate pumping and filtration schema would be required. As it is, this is a gorgeous, functional, purely ornamental effect. A second, minor concern, or note I have is to the folks doing the chemical additions. If you intend to continue using solid oxidizers, take note of the damage occurring to the concrete as a consequence. I encourage you to fit or buy a simple feeder for your tablets, and not simply toss them in the waterfall basin where they are digesting the bottoms concrete, exposing wire mesh. Close: This system gets high marks in all respects; design, construction, and operation. It might not be what you or I consider a beautiful pond, because it is bereft of life and has a high electrical bill to go with all the waterfall splash, but it is doing what it was designed to do. Fenner, Bob & Rick Aspray 1983. Ornamental fish ponds. Filters: design, construction and maintenance. FAMA 6/83. Fenner, Bob 1988. Water Effects: size and shape. FAMA 5/88. Fenner, Bob & Matt Tsunoda 1988. Waterfall construction. FAMA 11/88. Fenner, Bob 1988. Aquatic Gardens: Plumbing. FAMA 12/88. Fenner, Bob 1989. Pumps: An introduction. FAMA 1/89. Fenner, Bob 1990. Upflow filters (for biological ponds and multi-tank systems). FAMA 2/90. Fenner, Bob 1990. Pond construction: (Processes in) Building concrete and liner (production) ponds. FAMA 9/90. Fenner, Bob 1991. Thorosealing cementatious water features. FAMA 5/91. Fenner, Bob 1994. Pond construction methods. FAMA 5/94. Fenner, Bob 1994. Concrete and block construction of ponds. FAMA 6/94. Fenner, Bob 1994. Filter media for ponds: A discussion. FAMA 8/94. Fenner, Bob 1993. 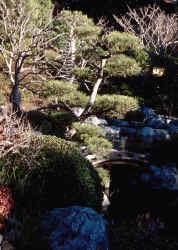 Electricity and electrical use around water gardens. FAMA 12/93. Fenner, Bob 1994. In-pond (versus outside) filtration. FAMA 9/94. Fenner, Bob 1995. Selecting a site for your outdoor water feature. FAMA 5/95. Fenner, Bob 1996. Plants and planting for water gardens. FAMA 6/96. Fenner, Bob 1996. Surrounding landscape plants for your aquatic garden. FAMA 9/96. Fenner, Robert M. 1997. Aquatic Gardens; Designing, building & stocking a backyard pond. Microcosm, VT.
A view of the system with its prominent waterfall of grey granite boulders. Some of these rocks weigh more than your car. A detail of the basins edge. Note the problem of the landscape being higher than the berm. This leads to solids and fertilizer washing into the water; directly exacerbating poor water quality conditions. The only "filter" to this system is the jerry-built modified skimmer emplaced to keep large solids like leaves and logs out of the pump. Swimming pool "skimmer baskets" have been placed on top of the original grating to facilitate smaller solids removal.